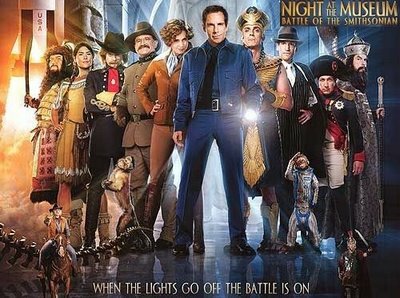 HBO Special - "Night at the Museum: Battle of the Smithsonian"
Things have changed in the years since Larry Daley (Ben Stiller) left the New York museum where he was once the night guard. Daley himself has flourished, founding a successful business that sells made-for-TV products while the museum is struggling. When he finally visits his old stomping ground, he finds that many of the exhibits are being packed up and sent to Smithsonian storage without the ancient Egyptian tablet that allows them to come to life at night (in case you haven't seen the first "Night at the Museum" that's pretty much the entire plot). Soon, however, he gets an urgent call from his friend/miniature Cowboy exhibition item Jedediah (Owen Wilson), who informs him that the tablet has come with them into storage and that they are under attack from all the various items packed away in the nation's capital. That is a lot of summarizing for such a simple kid's movie. As far as these movies go, "Museum 2" isn't all bad. There are a few laughs, Stiller is invested in his character (no matter how shallow it may be), and it all comes together fairly concisely. So it's not bad, it's just not necessary. This is the kind of movie that SCREAMS, "We know we can make a ton of money on this no matter what kind of crap we throw on screen." The first "Museum" was a surprising success and a movie that really had some fun, valuable moments. I actually quite enjoyed the first film, though I admit my expectations were virtually nil going in. The sequel, however, is clearly stretched for quality content and is hampered by a plot that doesn't really leave much room for growth or development. Even supporting actors like the multi-talented Hank Azaria and Soap Box Office-favorite Amy Adams can't find much of a groove to work in as the whole movie just seems to be spinning its wheels. I know, I know, it's a kid's movie, it's not supposed to be inherently complex or layered. But we live in a world in which movies like "How to Train Your Dragon" and everything Pixar has ever done have set a standard for making smart, dynamic children's movies. 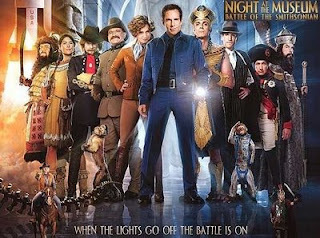 By contrast, "Night at the Museum 2" fails to produce much of anything you could expect me to recommend.